Hello, hello! As promised I’m back from my Spring Break. I wanted to post this last week, but I quickly changed it. Well I can’t keep you in suspense any longer. Richelle Murry, the lady behind Esquisses, is April’s spotlight artist. My reason to do this? Well, I wanted to show that I’m a jack of all trades. I’m pretty much a self-taught artist. I didn’t even think I had it in me to sketch or paint. Once I took an art class in my senior year at George Washington Carver High School, I knew this is what I wanted to do, but life took a different path. I doodled over the years, keeping my skills in check, but it wasn’t enough. Now, I got my creativity back! Lady In the Water during the 1990’s. Pencil and pastel on paper. I honestly can’t say what my style is, but I love to try new techniques to bring my work to life. I’ve delved into pencils, colored pencils, pastels, oils, acrylics, watercolors……what I would love to tackle next? Digital. I did a few, but in time, I will get better acquainted. 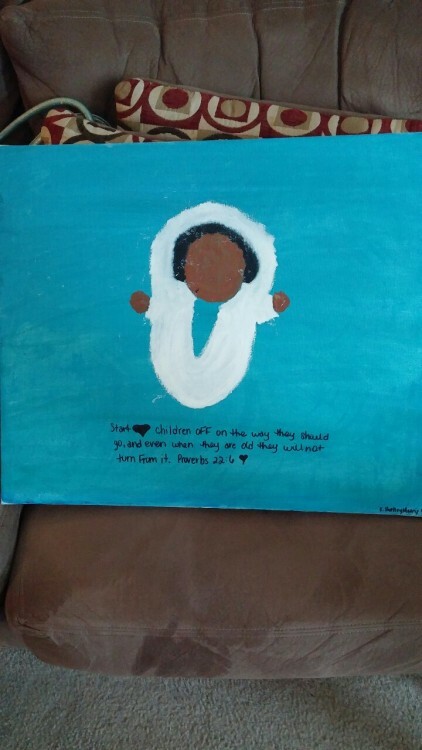 My latest creation for my soon-to-be nephew, oil and acrylic. I’m always practicing my drawing skills. To me, they help me focus on some of the things that need attention to. I’m sure other artists do the same. I feel that my work is amateurish, maybe not perfect but I’m always determined to improve, coming into my own. I just like to tell a story. You can check out my webpage: skyris.wix.com/richellem. I’ll return Saturday with a special Art Scene Newsletter. Enjoy your day and be blessed!